Whenever I don't have time to make my own pasta sauce ( I do have time but I'm too lazy ) then I do like most people and buy a jarred sauce from the market. There are tons of different sauces out there and I've tried most of the familiar ones like RAGU, PREGO, FRANCESCO RINALDI etc., but lately I've been wanting more. The sauces I've mentioned are perfectly OK but they don't have that fresh taste like when I've made my own ( those couple of times , yeah, I know ). So I decided to start trying the " premium brand " sauces but WOW , are they expensive. I really didn't want to spend 5,6 or 7 bucks on one jar. So I looked for a premium that was on sale. That's how I came to find SILVER PALATE . It was regularly $ 5.99 but I got it on sale ( Stop & Shop ) for only $ 3.50. Not bad. 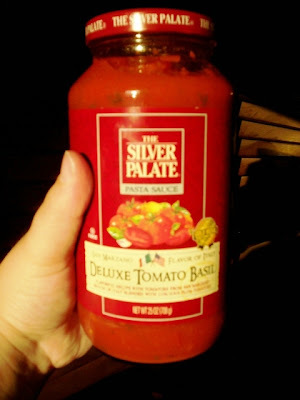 I bought the Deluxe Tomato Basil flavor ( there were others ) and brought home the 25 oz. jar. The jar states that it's made from San Marzano tomatoes ( the ones everyone goes nuts for ) and blended with luscious plum tomatoes. The jar also states that it's won an award for superior taste from the American Academy of Taste ( what the he** is that ? ) . I'm very impressed that besides the 2 kinds of tomatoes, the sauce only contains imported olive oil, fresh onions, fresh carrots, salt from garlic, pear concentrate (?) and spices. That's a nice,short, fresh-sounding list of ingredients. THE VERDICT: Terrific. It was a nice thick sauce, very tomatoey but not watery and very lightly spiced. It tasted very fresh and even though nice and thick it was very light tasting , like fresh tomatoes. I really enjoyed this sauce and I'd definitely buy it again, maybe even at the regular price. That's saying a lot for me, and this sauce. So try some yourself. I don't think you'll be sorry. Nice, now I feel like having pasta.